Born Pretty Store sent me this pretty unicorn powder to try out. It only really works to it's full effect over gel polishes/ topcoats,which we know from the other powders out there and normally I do it over a dark colour to see how it turns out but this time I decided to try it over Barry M Cotton.It's a fab result and it gives it a kind of pearlescent glow. I did have a little bit of trouble getting this to work properly and this may be because of the type of gel topcoat I have, it's the one where you have to wipe the sticky layer away and because I'm not very well versed in gel nail polish, I'm not sure if it would maybe work better over a no wipe topcoat. But basically, I couldn't get it to stick properly and when I tried to rub it to get the proper effect rather than just the glitter look, it left patches where it had come off. I did eventually get full coverage but it did take a lot of powder and a lot of light rubbing with my finger. It seems like you need a very light touch. I do really like this look over the white and I have some flakies coming up so might try them over a light colour with some nail art, just to break out of my rut. If you fancy giving this powder a go then you can find it here for £2.29/$2.99 for a 0.2g pot, this size will give you a good few mani's. 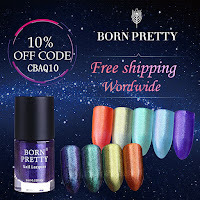 Don't forget that you can also use my code CBAQ10 for 10% off all non sale items.